The iPhone 8 Plus features a bigger screen and a bigger battery life than its iPhone 8 sibling. The design hasn’t changed tremendously, but almost everything else has, and while the iPhone 8 Plus may not seem like much of a refresh, it’s proof that it’s what on the inside that counts. It seems like an “s” year, and after being introduced to a mid-generation model every year for the past three generations, that’s certainly what we were expecting. And yet that’s not what you’ll get in the iPhone 8 Plus. Not quite, anyway, because while there’s a new number and a clearly different design, Apple’s iPhone 8 Plus feels very close to what the iPhone 7S Plus could have been. That starts with a refined design, as Apple evolves the style that didn’t change much in the leap from iPhone 6 to 7, and yet changes now. The design change isn’t a total rethink, however, as Apple keeps with aluminium to build the frame for the new iPhone, switch to glass for both the front and back. 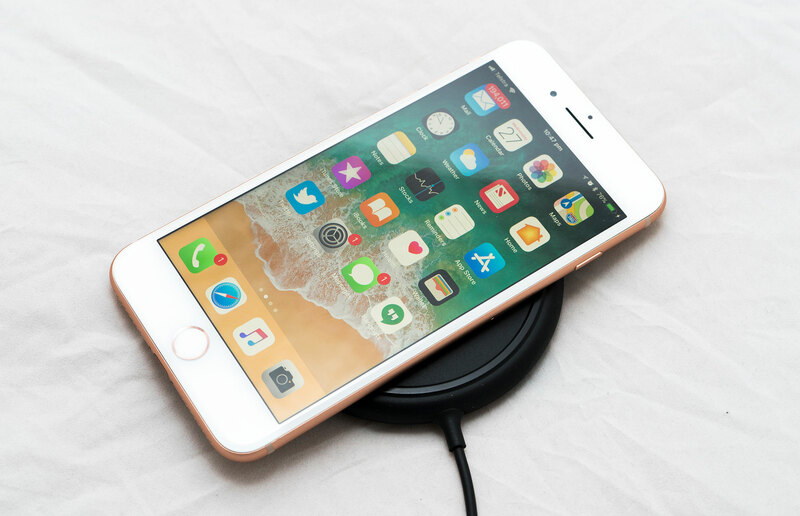 This change isn’t simply to be different, but rather because it allows Apple to bring in wireless charging, as a feature known to Android and the few Windows Phone customers finally makes its way to iPhone owners, too. A shift to glass has changed the overall feel for the iPhone 8 Plus, and now much like the Sony’s Xperia XZ Premium, the phone feels like it has arrived from the future. It’s not as future friendly as say Samsung’s latest, and that’s because the front design hasn’t really changed. 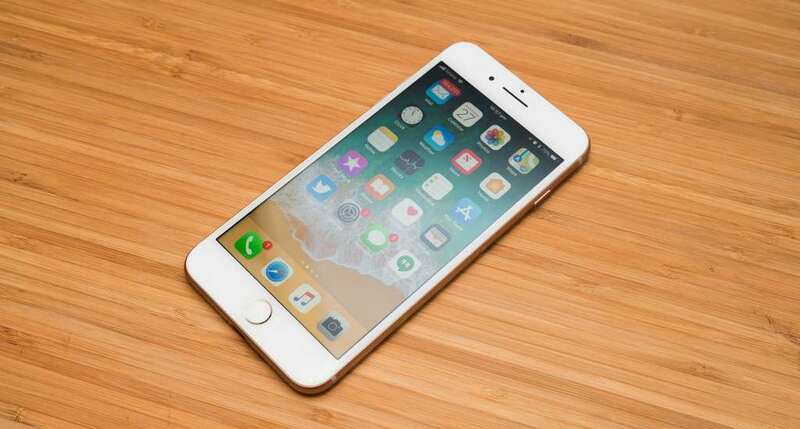 If you were at all afraid the future of the iPhone would make a flying leap into the practically bezel-less design that both the variations of the Galaxy S8 provide, you can rest comfortably because this is the same bigger iPhone you know and love, with a 5.5 inch display punctuated by the home button at the bottom, which as per last year’s change is still technically not a button. In fact, everything else that has been changed outside of that glass design is found on the inside, where the hardware has been pushed even further. Apple’s iPhone 8 Plus isn’t last year’s 7 Plus, and even though it shares a few similarities, it is clearly different, sporting the new A11 Bionic processor, a six-core chip designed to be both more efficient and better performing overall. 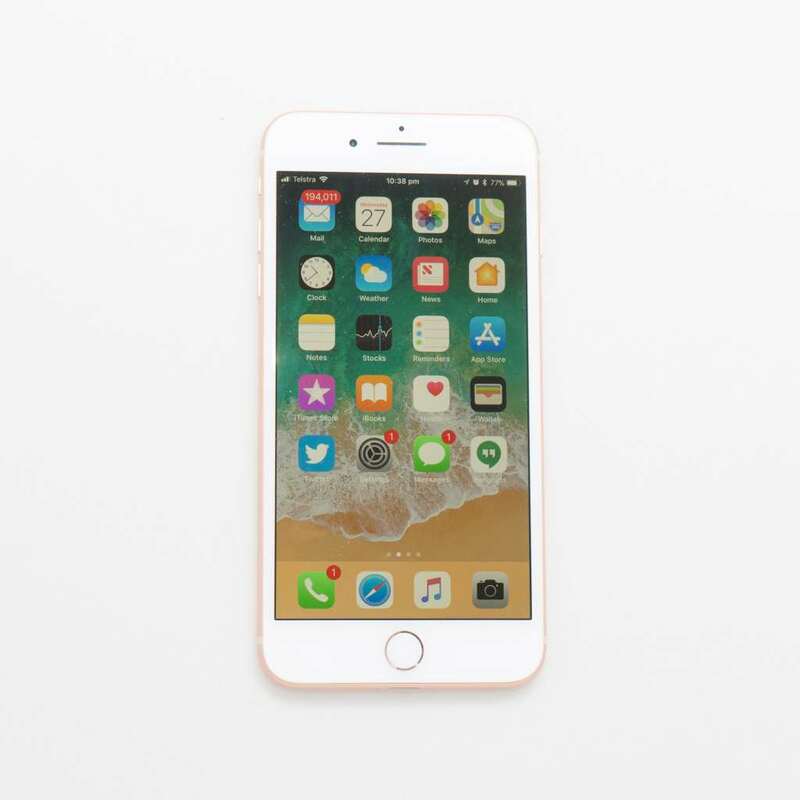 The handset features 3GB RAM and Apple’s own graphics chip and motion chip, and all of this works with Apple’s iOS 11, the latest of Apple’s mobile operating systems. 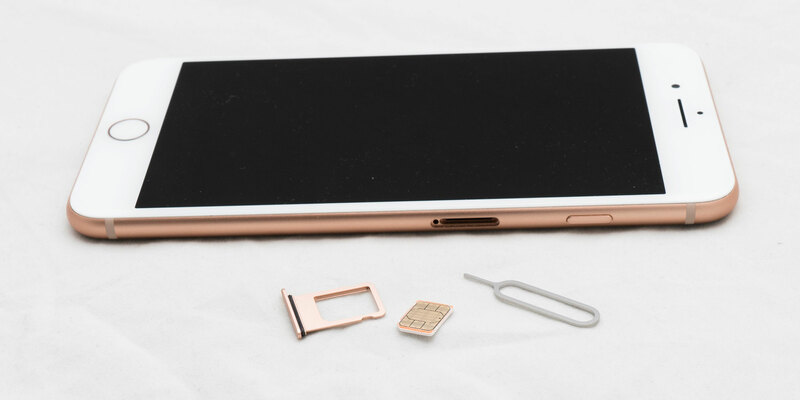 Storage options for the handset sit at either 64GB or 256GB, and continuing on with how Apple has done things for years, there is no microSD card slot, leaving you to decide how much storage you need at the beginning: the basic 64GB or the more future-proof 256GB. 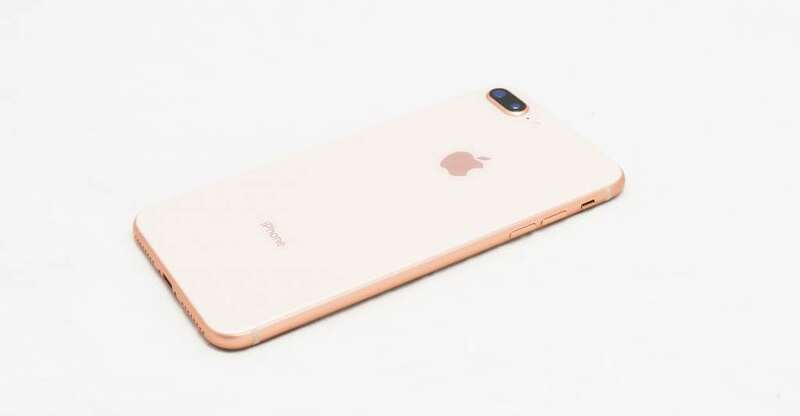 The camera technology has improved slightly on the iPhone 8 Plus, with the rear sporting two 12 megapixel camera, one offering a wide-angle lens with F1.8 while the closer telephoto lens sports F2.8, with 4K Ultra HD video able to be captured on both. A quad-LED TrueTone flash is part of the package, as well as Apple’s “LivePhotos” concept that captures a bit of video with the image, and optical image stabilisation is provided for the handset. At the front, you’ll find Apple’s modern FaceTime HD camera boasting 7 megapixels at F2.2, with video capture limited to 1080p Full HD. 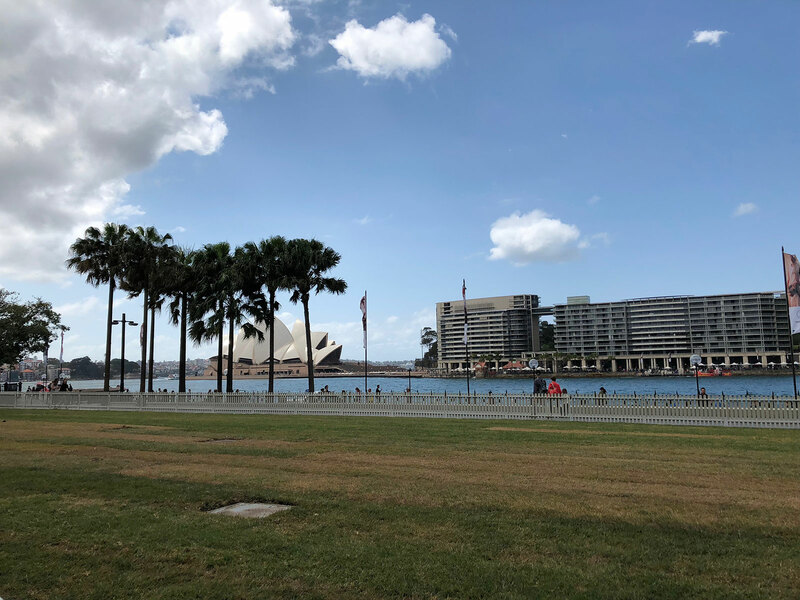 Wireless connections are relatively strong, though quite normal for a flagship handset, sporting 802.11a/b/g/n/ac WiFi, Bluetooth 5.0, GPS and GLONASS, and Near-Field Communication (NFC), though the latter is strictly for Apple Pay. 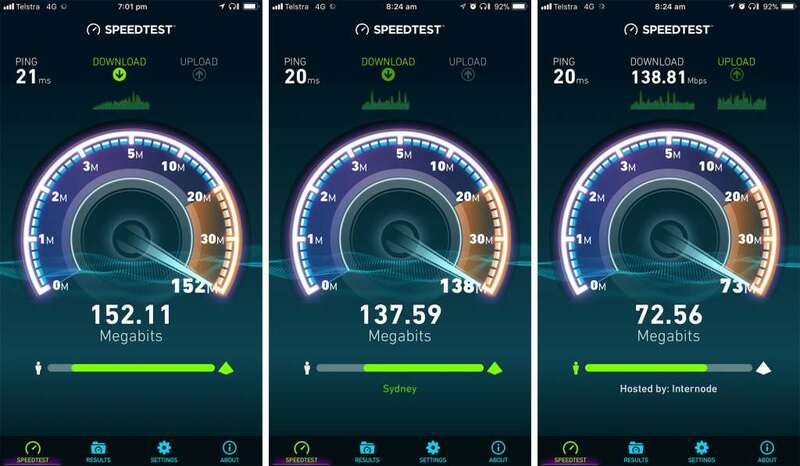 Apple has also included support for Category 16 LTE on 4G, meaning speeds as high as 1Gbps down are technically capable, even if your telco will likely be the bottleneck. Wired connections are a little limited, and like last year, you’ll only find one, as the 3.5mm headset jack is no longer part of the design, as Apple shifts that to work on its Lightning port for data, charge, and audio, all found at the bottom of the handset. All of this sits below a 5.5 inch Full HD screen sporting 1920×1080 and a pixel clarity of 401 pixels per inch. Buttons are the same as last year, with the power button on the right edge, while volume buttons and a silence switch sit on the left edge. 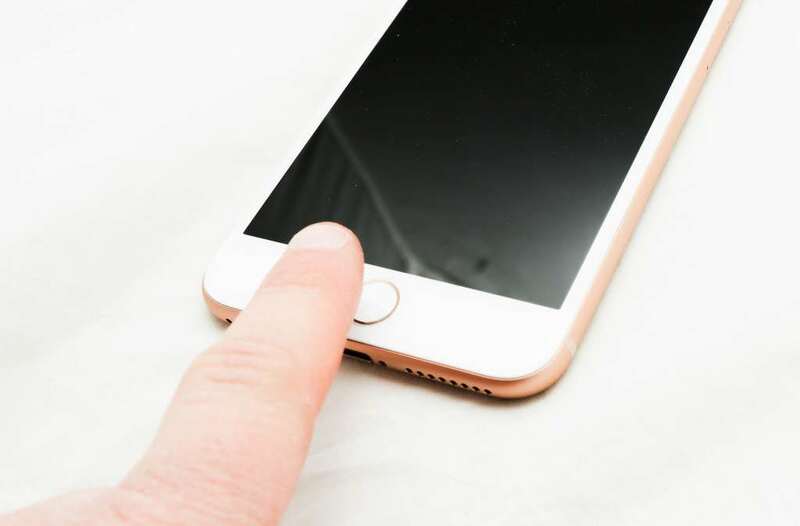 Apple’s button-less home button with the fingerprint sensor beneath it sits under the screen at the front. 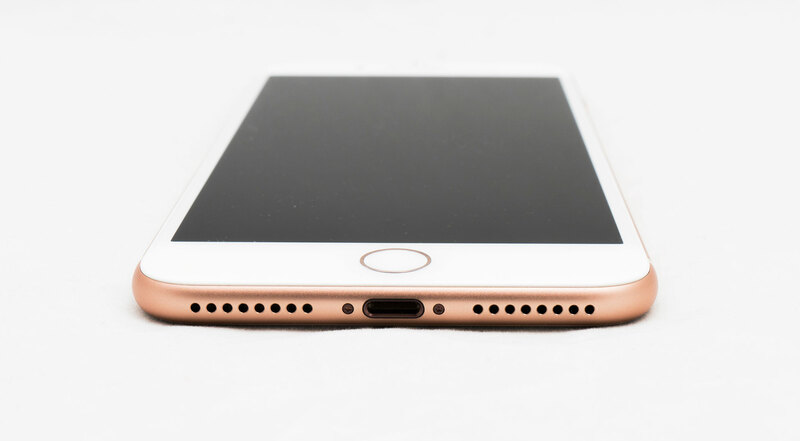 The Apple iPhone 8 Plus measures 7.5mm thick, weighs 202 grams, and is practically identical in size and measurements to the 7 Plus, meaning all previous cases should work. Its design is constructed from both metal and glass, and like its predecessor, is rated for IP67 water resistance. 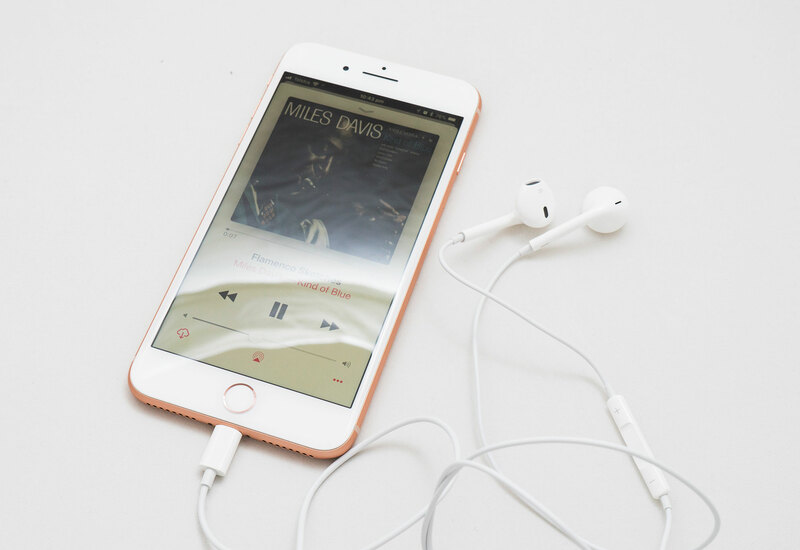 With the features out of the way, it’s time to get stuck into the phone, and if you’ve used an iPhone before, you probably won’t be surprised to find the iPhone 8 Plus works exactly like you’ve gone to expect. That’s the great thing about the iPhone: played with one, you’ve played with them all. Switch the iPhone 8 Plus on and familiarity takes hold, with the delightfully simple constantly scrolling app menu available to you, as iOS 11 continues what we’ve all seen time and time again. While you won’t get the level of stylistic control an Android delivers, for many that’s not desired, as Apple’s iPhone keeps things easy and simple. For folks who want a phone that requires little to no effort using, that is easily the iPhone. Apple secures this easy experience with a fingerprint-enabled button that isn’t technically a button, as the button-less button makes a return. Like in last year’s iPhone 7, the button-less button is more of that haptic research following on from how the company makes the new trackpad for its laptops, with vibrating replacing the job of a physical button. You can define the strength of the button, and it doesn’t take long to convince you that it’s a real thing, except for the fact that you can’t push the button while the phone is off (but why would you?). Apple also lights the phone up whenever you pick it up, so if you did need to press the button to bring it to life, you don’t really need to now, really finding that balance between “do I need a physical button” and “let’s just move on”. Operations are smooth and fast, and the system generally feels like it should, with little to no lag on everything you’re doing. You know that “new phone feeling”? The iPhone 8 Plus has it in spades. Good luck finding something this phone doesn’t do well, as it just flies. Even 4G managed to surprise us, mostly because we weren’t sure if Apple would support the highest speeds in its phone with a new modem, but hey, we like to be surprised. As such, you will find a Category 16 LTE modem in the Apple iPhone 8 Plus, featuring a staggering 1Gbps download maximum and 150Mbps uploads maximum, something we only realised was Category 16 when the upload peaked at 86Mbps, a dead giveaway for the technology on offer. Ultimately, let’s just say you won’t be dissatisfied with the way the iPhone 8 Plus performs. There’s another reason you’ll be intrigued and excited, and that’s because it’s the first phone to get Apple’s TrueTone technology, something we first saw in the iPad Pro that can change the colour balance to what the changing definition of white is for your eyes. Let’s just get this complicated one out of the way first: white doesn’t technically change, but depending on where you are and the light temperature, white can render differently. The lights you work under can change the white balance as can the time of day, and all of this can make the white of your screen not feel like the white you know you’re looking at. 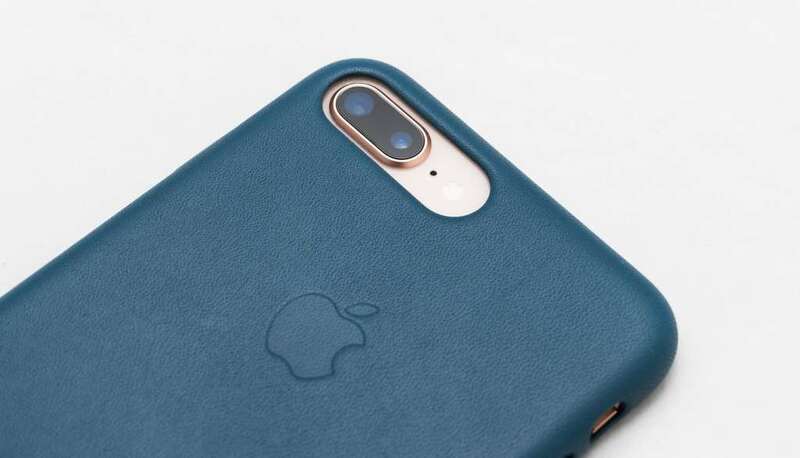 That’s what Apple’s “TrueTone” concept aimed to correct when it launched in the iPad Pro, and this year, the iPhone 8 and iPhone 8 Plus each receive the technology. In practice, that means colours, photos, and even the white backing of text on a page renders a little better for the eyes, and the screen really comes across as if you’re more comfortable reading it. Overall, it’s a great inclusion, and one we’re delighted to see make the transition to smartphone. One of the highlights of the iPhone 8 Plus is easily the camera, and while it might look the same as last year’s model, there are improvements to the sensor and some cool new lighting modes. Technically, the hardware reads as more of the same, but this is a new camera, and wow, what a camera it is. In a year when Samsung’s Galaxy Note 8 is giving other dual cameras notice with strong competition, it’s great to see Apple step up to the challenge. As such, you’ll find strong colours and a good handling of depth in daylight, while low-light handles itself well when you’re outside. Inside and in the more lowly lit environments, we found the camera a little wanting, but fortunately you have a four-colour flash at your disposal. The camera is also famed because it’s one of the first that nailed zoom without a proper zoom lens, and Apple is still making sure folks are happy using that, with fast and clear zoom. In fact, one of the surprise hits from the iPhone 7 Plus is back with a vengeance, boasting a new mode to let you have some fun with. Last year, the “portrait” mode allowed users the ability to capture great portraits by combining the two cameras and basically defocusing the background, simulating how bokeh normally looks by providing a soft and lovely background for a portrait. 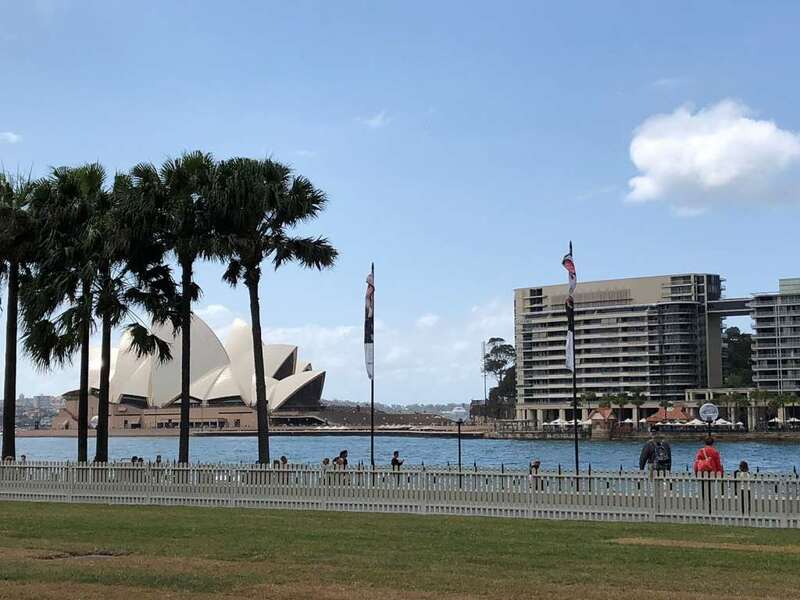 Because of its reliance on two cameras, it’s a technology that doesn’t exist on either the iPhone 7 or iPhone 8, as they only have the one, but it is one that works very well, and since leave beta last year, has proven itself. This year, Apple essentially pulls off the equivalent of its trademark keynote “one more thing” additions with the inclusion of a lighting mode that relies on data science and algorithms to simulate lighting the way a studio would do it. Part of the portrait mode, this is an iPhone 8 Plus feature only, and not only relies on the dual cameras, but the advanced internals of the new phone in order to do what it does, going beyond merely just brightening the image, but changing the lighting on the subject’s face to simulate realistic lighting. In practice, the results are very interesting, with the combination of cameras and algorithmic analysis able to do a semi-decent job of separating foreground from background, while touching up skin tones for colour control. There are some hits and misses, but the iPhone 8 Plus’ experimental camera mode is intriguing, and it best works when there actually is depth and your subject isn’t pressed against a wall or surface. Curious how the new portrait lighting mode works? Emma takes you through the various lighting stages. 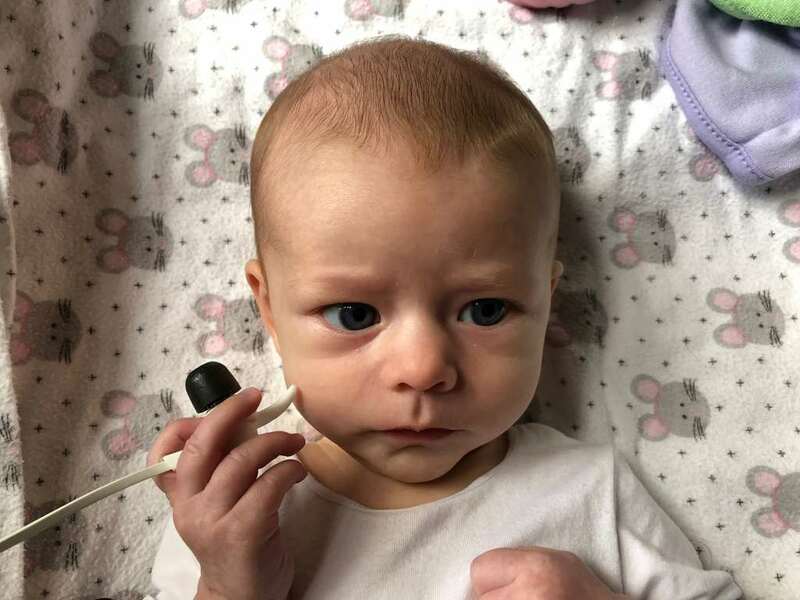 You do need a bit of room between yourself and the subject to make this work, but the results can be edited after capture thanks to Apple’s use of a non-destructive image format, meaning tweaks to the lighting aren’t final and you can always go back to edit. At the front, you’ll find a camera capable of seven megapixels, and this is one area that feels more or less spot on where Apple left it. That means you’ll get a nice selfie camera with acceptable low light, though we think other smartphones may have a bit of an edge in this department. Other similar-sized phones also have an edge in another department, as battery life sticks where we expect it, producing a full 24 hours of life, but not much more. That means you can expect to get a day without fail, with our test covering phone calls, text messages, email, web surfing, social media, taking quite a few photos, and general use of the phone without fears the battery will fail. You will want to plug it in overnight, though, as you’ll probably only see a little more life, with the battery extending a few hours into the new day. If you had to, we suspect you could drag a half day out of the iPhone 8 Plus’ battery past those initial 24 hours, but really this is a day phone. Battery already has a bit of a question mark hanging over its head simply because you can find other devices with a similar screen size that hit the full two days, even if Apple is perfectly solid with a day of life for a flagship phone. Really, though, our biggest dilemma comes from the price, because whoa mama, the iPhone 8 Plus is not a cheap phone, not by a long shot. That’s to be expected, mind you, as Apple doesn’t really do “budget”. In fact, with a starting price of $1229, Apple’s iPhone 8 Plus is anything but “budget”, approach the limits of how much we’d want to pay for a phone. 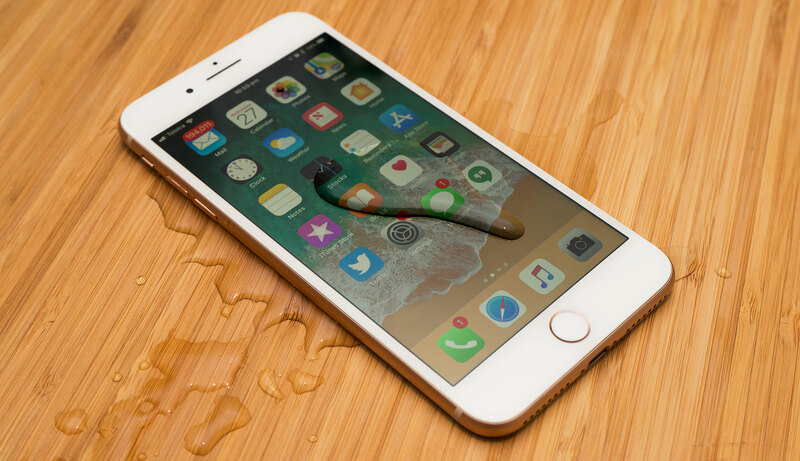 The problem with the iPhone 8 Plus, however, isn’t that the phone has a high price, but rather that you feel like you’re getting a refreshed phone for the price, especially in comparison to what’s out there. We do need to get this out of the way, however, because the iPhone 8 Plus is one impressive phone, and while it doesn’t have the feel of the future-friendly iPhone X, almost everything else is close to being the same. That doesn’t necessarily grant the iPhone 8 Plus the label of being “value”, but for an iPhone this year, it’s still not completely terrible. Sufficed to say, we wouldn’t say Apple’s iPhone 8 Plus is horribly priced, but rather that it needs work. In the grand scheme of things, you’re paying a high price because this is an iPhone with some pretty spectacular hardware inside, even if the design is getting a little tired. But hey, if you want the new iPhone hardware in a new design, wait until the end of October, because there’s a new phone made for you coming out then. Price notwithstanding, most of what’s found in the iPhone 8 Plus works very well. Seriously people, this is Apple: it doesn’t like to make mistakes. That being said, you will find a few operating system bugs here and there, but most of the time they flash in and out as if iOS 11 is aware something is amiss. 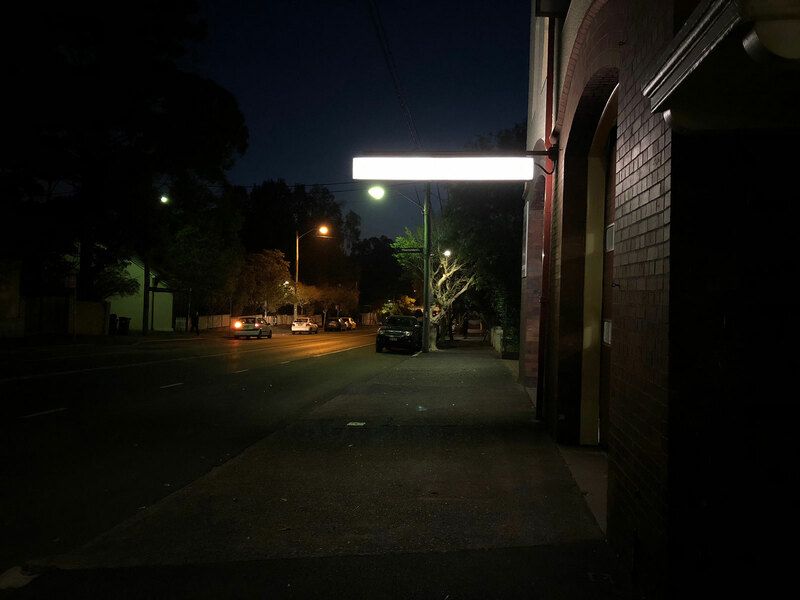 We’ve seen the camera flash to a different screen more times than we could count, and the home screen has seen a slight ghosting effect at one point, but they’re all basic issues that literally disappear just as quickly as you notice them. Despite these, Apple’s biggest problem with the iPhone 8 Plus is that it doesn’t feel like much has changed, outside of the reliance on glass. Sure, you get a slightly new design, and that slightly new design makes it possible for the company to throw in wireless charging, but outside of the new back, the iPhone 8 Plus looks exactly like the iPhone 7 Plus, so we can see why it might give some folks pause. Really, the biggest flaw in Apple’s iPhone 8 Plus might not be how it has been designed or what sort of technology is found inside, but rather how it has been named. 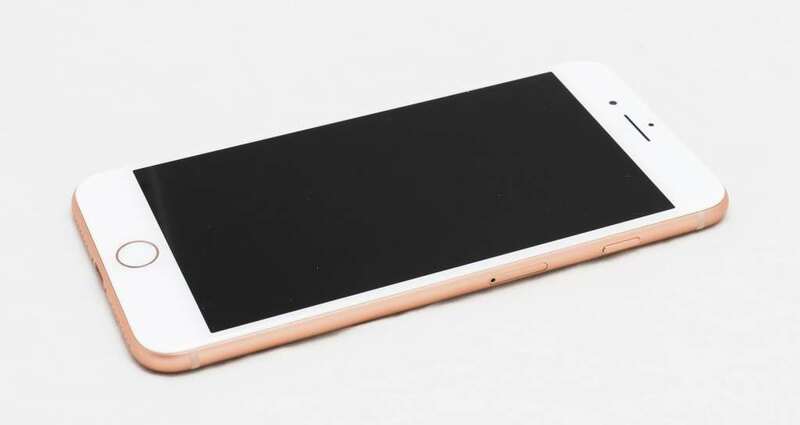 Apple’s latest big phone is named the “iPhone 8 Plus”, but in a year where you expect a bump in specs for Apple’s normally named “s” phones, the iPhone 8 Plus feels more like an Apple iPhone 7S Plus. For Apple, the “s” years are when the company applies some of the industry leading technology to provide a bit of a refresh for what is typically a two year product design cycle. You get a new iPhone every year, sure, but Apple doesn’t typically change its design until after two years, with the logic being the first year is the new design, and the second is the really cool innovative technology. In the past, this has included the fingerprint sensor and the taptic screen technology, among other things. 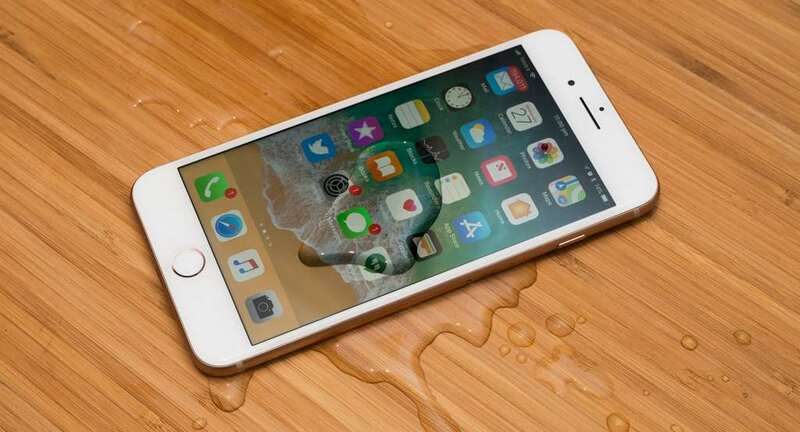 Essentially, after the iPhone 7 Plus, it was expected that we’d get an iPhone 7S Plus, and he more you play with the iPhone 8 Plus, the more you feel that it’s technically the 7S Plus. And yet that’s not how it’s named. Curiously, Apple’s iPhone 8 Plus competes against quite a few other phones sporting the “8” in their names. The main competition is quite clearly the Samsung Galaxy S8, Galaxy S8+, and Galaxy Note 8, and it’s this naming scheme that makes you wonder whether the iPhone 8 and iPhone 8 Plus were named as such because Samsung has so many models with the “8” moniker. It’s not unusual for people to regard a new number as proof that it is newer, and so if the Galaxy Note 8 and Galaxy S8 both feature an “8” in the name and the iPhone 7S Plus only has the “7”, perhaps a customer might be lost. That’s our thinking for why the iPhone 8 Plus is named as such, instead of the just going with the typical “s” monikers. It’s important to note that the smartphone market has never seen competition quite this intense, and Apple has previously held quite the lead over its competitors. 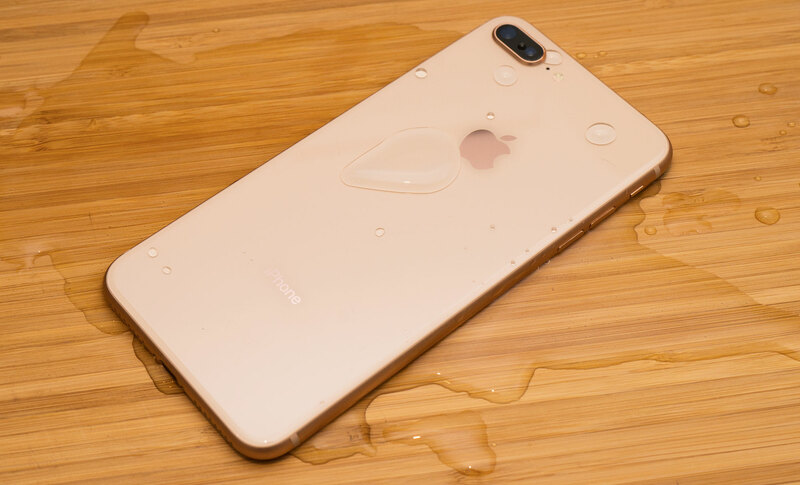 But in the past year or two, and as Samsung made waterproofing and curved screen technology the reasons for people to make the switch, Apple and Samsung are now fighting hard for that number one spot. Really, it would be totally unsurprising if marketing played the main reason as to why our iPhone 8 Plus was named as such. While the Apple iPhone 8 Plus won’t excite every customer, Apple has more or less delivered exactly what we expect from the brand during an “s” year. Try as Apple might to disguise the iPhone 7S Plus as an iPhone 8 Plus — because that’s really what this is — we can see through the costume, and you probably will, too. But that’s not a bad thing at all, not in the slightest. The iPhone 8 Plus is still an excellent handset boasting one of the best cameras in the business, a slick design, and a charging mechanism that really does make the iPhone more like what you’d want in your life. Seriously, we’re shocked it took Apple as long as it did to pick up on the wireless standard that is Qi, but we are glad it did. 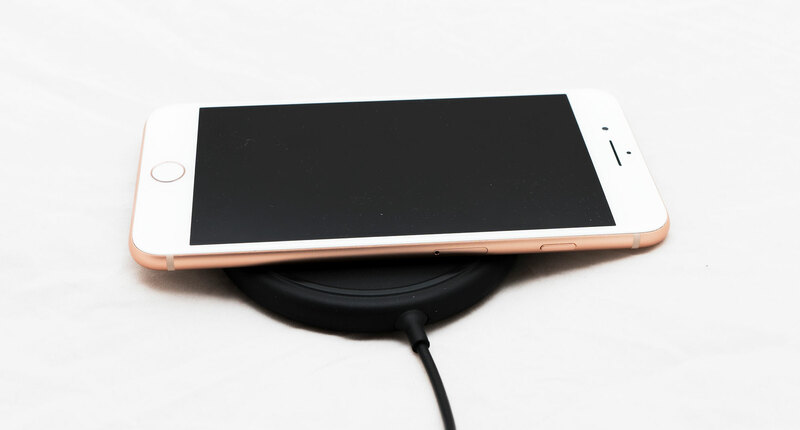 Wireless charging pads can be found easily, and the technology can also be found in furniture, making it one of those things customers will be glad their phone has adopted. So that’s a positive, as is almost every other aspect of the iPhone 8 Plus, barring that of the cost, which can be a little excessive. But again, it’s an iPhone. That’s not an excuse, by the way, just a realistic expectation. These things aren’t cheap, and so seeing roughly the same price for the new model isn’t something that shocks us. That doesn’t mean we necessarily agree, but we do get it. And for folks who love that old iPhone design but want something with new hardware, they will too. Without doubt, the iPhone 8 Plus is the best iPhone you can find today, even though we suspect most of its buyers would prefer the more future-friendly iPhone X, which is pretty close except for that lovely screen. If you love the iPhone and can live without the big practically edgeless screen, you’ll find plenty to love in the iPhone 8 Plus. Recommended.